"Stamina is his forte and has never fallen in 17 career starts"
Ramses De Teillee and Pleasant Company are my two against the field in this historic event. Ramses De Teillee is only seven, but has made a big impact in long distance staying chases this term. He ran a blinder when chasing home Elegant Escape in the Welsh National at Chepstow in December. Although blundering four from home, he recovered well and made the winner work hard all the way to the line. On his next start at Haydock he fought bravely, and was only just denied by Robinsfirth close home. Stamina is his forte and he has never fallen in 17 career starts. At present he is trading at [29.0] on the exchange which is too big to pass up. Pleasant Company made Tiger Roll pull out all the stops to hold on in this race last year. He got his second wind at The Elbow and would have prevailed in a couple of more strides. Trainer Willie Mullins has given him a couple of prep races this season, and the horse should be ready to do himself justice. This is his third crack at the National, and has jumped well in the main on two previous attempts. He has taken a hike in the weights, but is proven at the distance and is a sound jumper. At present he is trading at [20.0] on the exchange which is more than fair. Sam Spinner is my idea of the winner of this intriguing Grade 1. This talented performer bounced back to form when finishing an excellent second to Paisley Park at Cheltenham last month. He was headed on the run to the final flight, but kept on stoutly and finished well clear of the third. This was by far his best effort of the season and it was no fluke. He looked fed up with the game in his first two starts this season, but trainer Jedd O'Keeffe has got him focused again and a big run is expected. At present he is trading at [7.0] on the exchange which is generous. Apple's Jade is the short priced favourite at [2.66] on the exchange. 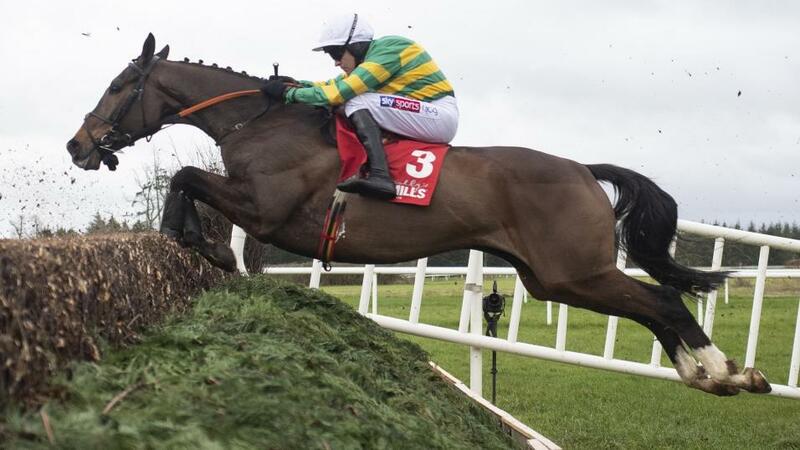 She was a bitter disappointment in the Champion Hurdle when finishing a well beaten sixth to Espoir D' Allen and though a high class mare that has looked unbeatable at times there was no apparent excuse for her defeat at the Festival. I do not like making excuses for beaten horses, and I can afford to let her win at that price. In fact I will probably end up laying her.